Madampe is a small town in Puttalam District. 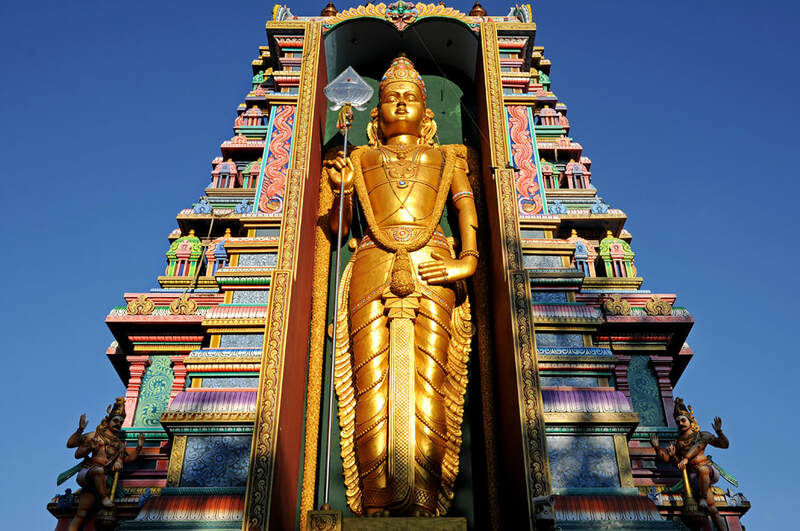 The Murugan temple, situated at the main road 9 km south of Chilaw and 10 km north of Marawila, is an extraordinarily neat Tamil temple, even more colourful than other Hindu Kovils in the modern Drawidian style. The temple is known as Punchi Kataragama temple, also called Replica of Kataragama temple, Kataragama being the Sri Lankan name of the Southindian deity Murugan. The large temple complex, opened in January 2012, was donated by a local businessman and land owner, who is involved in the production and delivery of toddy. Madampe belongs to Sri Lanka’s main region of coconut plantations. Madampe has also a historic Hindu and Buddhist temple and a Roman Catholic Church dedicated to St. Sebastian. An old heritage attraction of the town is the Corea House, the historic private home of the Corea and Seneviratne family, who have been the owners of the estate since the mit 18th century on behalf of the Kandyan kings.